"Carnatic Music Vocal Award" by Ministry of Culture, Government of India. Founder of Sangeeth Sagar Cultural Trust and conducting 5-Days Tamil Isai festival in Chennai for past 13 years. Having students in various states in USA since 2003. 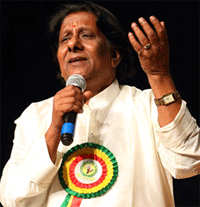 Performed few times in FETNA and various Tamil Sangams. Expert in Tamil, Telugu and Sanskrit stage performance and teaching.